On March 15, 2019, John Palter presented a paper on Business Dissolution, Termination and Winding-Up to the 10th Annual Course on “Essentials of Business Law: Practical Considerations,” co-sponsored by the Business Law Section of the State Bar of Texas. John’s paper (co-authored with Jim Phillips) was entitled Closing Time — Issues to Consider when Terminating a Business, and outlined the various ways for ending a partnership or corporation under the Texas Business Organization Code. 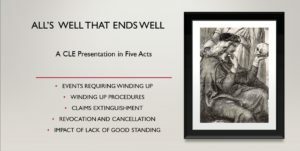 There are remarkably few judicial decisions providing definitive guidance on these issues, and Closing Time summarized the most helpful ones for course attendees. For those interested in attending the course, there will be a video replay version presented in Houston on May 2 and 3, 2019 at the Hilton Houston Westchase, and the course will also be made available online in the near future. To register, visit here.